A prominent social issue Canada is currently facing, and one that has been documented for decades, is the number of missing and murdered indigenous women. It is widely noted that the proportion of missing and murdered indigenous women and girls in Canada, compared to the proportion of Canadian women of other ethnicities, is extremely disproportionate. The Native Women’s Association of Canada has conducted research stating that indigenous women are involved in, “approximately ten percent of all female homicides in Canada. However, Aboriginal women make up only three percent of the female population.” Further, included in their research are the findings that over half of the cited cases, fifty-five percent, are women and girls under the age of thirty-one. This issue has resulted in annual protests and vigils demanding proper attention from the Canadian government. In 2015 the Liberal Government, under Justin Trudeau’s leadership, campaigned on the promise that they would launch a national inquiry into the cases of the missing and murdered indigenous women. Finally, this national inquiry’s initiation was announced on December 9th, 2015 by the Liberal Government. The video above discusses the phases of the National Inquiry for Missing and Murdered Indigenous Women. In 2014, the RCMP put out a report which stated that there were 1,181 reported cases of disappearance and/or homicide involving Indigenous women from 1980-2012, not including the staggering amount of cases that go unreported. This inquiry gained traction when the body of 15-year-old Tina Fontaine’s body was found washed up in a Winnipeg river. This homicide brought national attention to the high levels of violent crimes faced by Indigenous women and the amount that go unsolved. This artefact is an essential element in the discussion of “The Canadian Person” because it acknowledges the shortcomings of government and society in allowing Indigenous communities to experience such violence, for so long. The National Inquiry for Missing and Murdered Indigenous Women is providing services that are rightfully due to Indigenous families and communities. 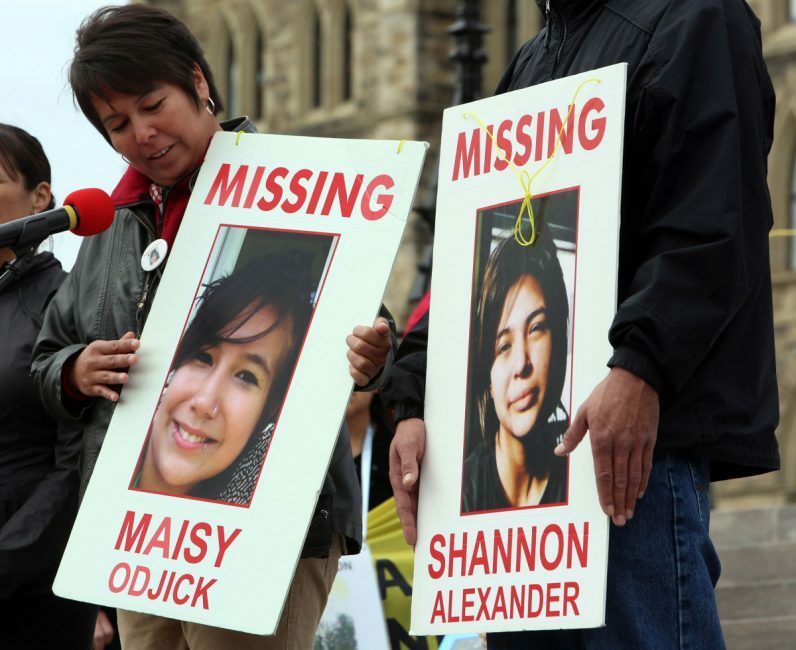 The CBC has created a database of missing and murdered Indiginous women. In a CBC news article, Anna Betty Achneepineskum, who is the Deputy Grand Chief at Nishnawbe Aski Nation, discusses the need for change regarding the treatment of Indigenous women by society. Achneepineskum points out that society, media, law enforcement, and to a degree some of the Indigenous community, assume that a disappearance and/or homicide is in some way connected to the “high-risk” lifestyle of the woman. Achneepineskum believes that this assumption devalues Indigenous women as the crimes committed against them are not pursued to the full extent of the law. The inquiry starts to acknowledge the systematic flaws that have negatively affected Indigenous communities for decades. The Royal Canadian Mounted Police (RCMP) released the above report in 2014 about its preliminary investigation into Missing and Murdered Indigenous women and girls. This report provides the shocking reality of missing and murdered Indigenous women, and set the stage for the launch of the National Inquiry. Areas of focus in the Report include the numbers, risk factors, and the next steps.